Review: Data Boy is a proficient, all-in-one USB tool_DECEC_Decent ODM endows products with soul and vitality! DECEC_Decent ODM endows products with soul and vitality! There are sure some awesome tech gadgets out here on the Internet. Be it some super crazy invention, or a device that does some magic, you can never NOT be surprised by what comes out. When I saw the DECEC Data Boy, it quickly fell into the “must check out” category. There is really no specific function or title for Data Boy, as it is several things at once. Think of it as the tech version of the Swiss Army knife. Taking the basic shape of a memory stick, it offers different tiers of storage integrated into a tool that can be used as USB OTG, a charger between two devices, a data ‘cable’ and a memory stick. It may advertise all the bells and whistles, but how does it stand up and, most importantly, is it worth your money? Because nothing like it has ever been made before, Data Boy shows off a unique design. Comprising mostly of (strong) plastics, the tool doesn’t exactly shout out poor quality, but rather, feels sturdy. The rubber arms aren’t very agile however, and appear to want to pop out their sockets. Fortunately, they can actually move quite a bit and are well anchored. This main piece also houses the USB which you plug into computers. On the arms, you’ll find two male connections on each tip. Depending on your configuration, you could have either MicroUSB/MicroUSB or MicroUSB/Lightning. The top has a neat Zinc-alloy ring which allows you to conveniently attach it to a keyring. There’s also a smile-shaped line that lights up when the product is successfully connected to something. It’s small, neat and easy to use – just like it should be. Slightly bigger than a memory stick, which means you can take it anywhere. This is where Data Boy has the opportunity to shine the most. Due to the nature of the product, you could use it all day for various things. DECEC wants it to replace your memory stick, USB OTG dongle and even your data cable in some situations. Using a specially made processing chip, dubbed “Intelligent Chip”, it automatically detects what you want to use it for. Say you’re using it as a USB OTG dongle, but you then want to charge your Bluetooth earphones. Once you plug them in on the receiving side, the OTG function is switched off and the charging commences. Let’s break it all down and see how it performs. As you can imagine, a memory stick is a memory stick. There’s quite simply not much to say here. I would however like to mention a thing or two. Firstly, you won’t experience the usual gripe of inserting it correctly into the USB port, as the design means the smiley face is always facing upwards. Secondly, the transfer speed is probably not as fast as you’ll like it to be. Slightly slower than USB 2.0, it takes noticeably more time to transfer even just a few photos. This is likely due to the fact that it’s not exactly your standard data transfer and may have to go through the Intelligent Chip. Not a big deal, but could be better. What I’d say is the main function of Data Boy, the USB OTG feature works how you’d expect it to, granted that your phone supports it. Again it suffers from sluggish transfer rates, although it is stable and works without a hitch. To access it, you simply just open the File Manager and use “USB Storage”. It shares the same storage module that your computer writes to, meaning that you can basically plug your memory stick into your phone and access the same documents. Which is, kind of how you’ll expect it to work. The transfer rate is definitely fast enough to watch movies and video. I do think this is due to the fact that it is only reading from the storage and not writing to it, which takes longer. You cannot, however, transfer files larger than 4GB. This is a restriction placed on the FAT32 format, which is basically a way of storing data on hard drives. Your Android also uses this and it would unfair to criticize DECEC for using this as Android is designed for FAT32. This may also explain the slower data transfer rates as this format is known for being slow. 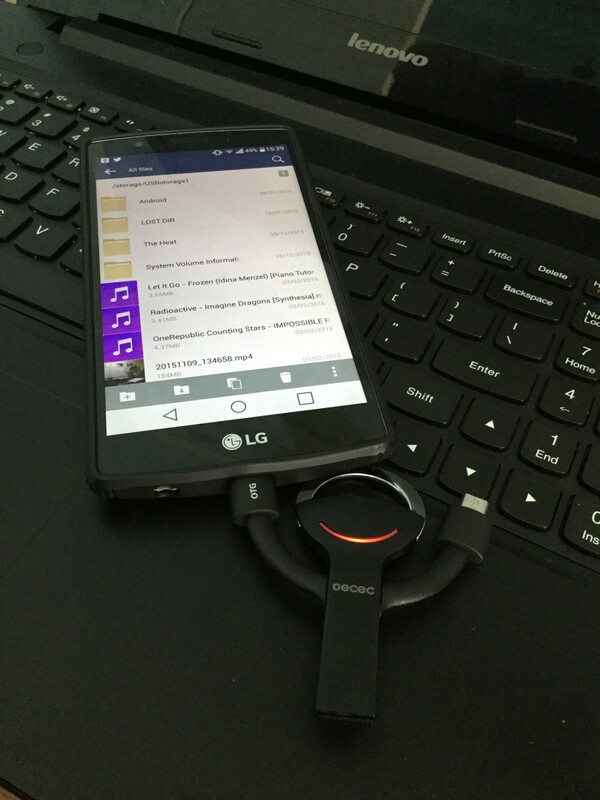 Of the two, only one connection supports USB OTG. When plugged into a PC port, Data Boy is a memory stick. Upon connecting your phone to the opposite end, it acts like a data cable, giving you the ability to transfer files from the phone storage to the PC via MTP, and vice versa. Likewise, it will also charge your phone at the same time. It worked superbly, and gave me faster transfer speeds as compared to when accessing the internal Data Boy storage. You can, if you’re desperate, connect your Data Boy to your wall charger and charge up to two devices through it at the same time. It charged my G4 at the same speed as the standard data cable. It is however awkward to use as it is very short and not very flexible, as I pointed out earlier. This is the one feature which is likely the most handy, although only if properly utilized. Connecting two devices on each arm of the Data Boy will initiate a power transfer. The phone on the OTG side will charge the device on the opposing side. Do not expect to swap charge between two phones, though. There simply isn’t enough power available to do so. It may take very long to charge even a little, even if a phone detects incoming power. You can only really charge items with small batteries, like a Bluetooth headset. You could also plug a power bank in the other side, which would effectively make it a data cable again. If it will help you on a daily basis, then it certainly is. There is no competition on the market as there is nothing else like it. For $25, you can get the 16GB MicroUSB/MicroUSB version, and for $30, you can get the 16GB MicroUSB/Lightning version. It is a quality product that should last through many occasions. DECEC’s Data Boy is an awesome, feature-filled USB utility. Extremely portable, it can be used virtually anywhere and can reduce the number of items you carry around to just one. The reliability, quality and usefulness of it makes up for the slow data transfers and limitations. It shall not disappoint you. Decent ODM is devoted to provide the innovative electronic products, products development and manufacture to the world famous companies. Pls pay more attention to our website for the latest news and products!